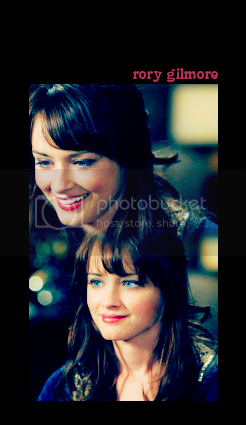 Fan Forum > Archived Forums > Alexis Bledel > Rory (Gilmore Girls) #5: Because she studied her way into our hearts. Rory (Gilmore Girls) #5: Because she studied her way into our hearts. Most of us came to know Alexis through Rory so the girl needs some appreciating! 1. She reads anything and everything. 2. She attacts cute boys like bees to honey! 3. She's in the top 3% of her class! 4. She's Chilton Prep's Vice President! 5. She's the sweetest kid in the whole world. 6. 'Cause she's like Lorelai, only she's got a slightly firmer grasp on reality. 8. 'Cause she can read a map. 9. 'Cause she doesn't want to flaunt it. 20. 'Cause she's going to Yale! 21. 'Cause she works at the Yale Daily News, and she's majoring in English and Political Science! 22. 'Cause she had to drop a class. 30. 'Cause she gave her mom the world's largest pizza sort of. 42. Cause she sang "Baby Face" without ever saying the word "Baby"
45. Cause she rolled into a ditch on her first pony ride. 46. Cause she's not really a mean Girl Scout (LDaT). 60. 'Cause she doesn't want to be labeled "the late girl"
71. 'Cause she won't let Lorelai date Luke. Oh, wait. That's why we hate her. 74. 'Cause she wants to travel around Europe with her mom (and they did!). 75. 'Cause she told Lorelai she got a foot fungus from the steam room to make her feel better. 76. 'Cause who would've imagined that a young girl could enjoy a simple afternoon with her grandfather. 77. 'Cause she needs serious paper. 78. 'Cause she's a smart girl and smart girls are mean. 79. 'Cause she'll help Lorelai push people out of the way when they're going for her size. 80. 'Cause she got hit by a deer and then stopped to check if it was all right. 81. 'Cause for the last time the name is RORY! 84. 'Cause she wants to travel around Europe with her mom (and they did!). 85. 'Cause she told Lorelai she got a foot fungus from the steam room to make her feel better. 86. 'Cause who would've imagined that a young girl could enjoy a simple afternoon with her grandfather. 87. 'Cause she needs serious paper. 88. 'Cause she's a smart girl and smart girls are mean. 89. 'Cause she'll help Lorelai push people out of the way when they're going for her size. 90. 'Cause she got hit by a deer and then stopped to check if it was all right. 91. 'Cause for the last time the name is RORY! 92. Because she's eight and her favorite hobby is making necklaces out of gum wrappers. 98. Because she's not Daddy's (Christopher's) little girl, not by a long shot. 99. Because she's protective of Luke. 104. Because she is smart! 105. Because she chooses the best boyfriends! 106. Because she got in to Yale! 107. Because she and Lorelai are best friends! To be added just ask in the thread! No problem. YAY for having a new Rory thread. it's crazy that she only has 5! It is! It should be at least five times as much. Should we change the cap of the moment? TFTNT! The title is so cute. I agree, it's very nice. Title credit goes to Patricia. love the new thread. I liked early seasons Rory more. I feel like she's more likable around Jess. Any suggestions what to change it for? that's from season 1 so maybe something from season 2? Sure! How about Rory in her debutante gown? Oh oh... you can't really see her gown there but how about when she's eating the hamburger like a lady at the end of the episode? That never fails to make me laugh.